The Odyssey White Hot Pro 2.0 V-Line putter is a putter that has designed using Odyssey’s EyeFit system to ensure that you get the proper head shape based on your set up to the ball. This putter comes with a 1-dash Eyefit numbers which means it is face balanced and best suited for those golfers whose eyes are right over the ball and have a straight-back-straight-through stroke. 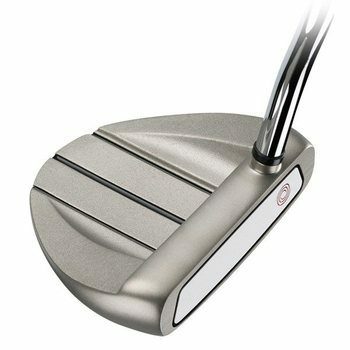 Odyssey have designed this V-Line putter with the famous White Hot insert, this is the 2.0 version which has a more consistent sound, feel and better all round performance off the face for greater consistency. With the three black sightline directly behind the golf ball you will find it so easy to get a repeatable setup and alignment. EyeFit is a mirror based system with the premise that your set up dictates your stroke shape. Eyes over the ball - more likely to have a straight back straight through stroke. Eyes farther away – more likely to have an arced stroke. The White Hot Pro line includes a handful of major winning, Tour proven head shapes like the #1, #9, Rossie and V-Line. The V-Line has a modified Hi-Def alignment system, ideal for the player seeking a high MOI mallet. Halpenny Golf currently serve over 125,000 returning customers and we pride ourselves in working to exacting international quality management standards. Our staff have a passion for Golf. With a PGA Professional in every store our customers can be sure that they get the best and most suitable advice for their every golfing need. We try harder to please, so buy with confidence at Halpenny Golf, the trusted Professionals.